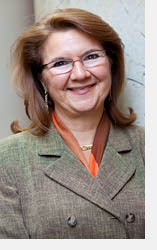 Cristina Amon joined the University of Toronto in 2006 as the thirteenth Dean of the Faculty of Applied Science & Engineering. In June 2010, Professor Amon was appointed to a second five-year term as Dean, beginning July 2011. She also holds the position of Alumni Chair of Bioengineering in the Department of Mechanical and Industrial Engineering. Prior to her leadership at U of T Engineering, she was Director of the Institute for Complex Engineered Systems (ICES) at Carnegie Mellon University, where she conceived and led interdisciplinary research initiatives, seeded high-impact projects, fostered a culture of innovation and promoted strong interactions with industry. A pioneer in the development of Computational Fluid Dynamics, Dean Amon continues her research here at the University of Toronto in nanoscale thermal transport in semiconductors and bioengineered devices. Dean Amon is deeply committed to reaching out to alumni around the world – alumni whose achievements strengthen U of T Engineering's international reputation, positioning it as one of the very top engineering schools in the world, ranking 8th in the world and 1st in Canada. * She is eager to engage in a dialogue with Skule™ alumni in Hong Kong to determine how U of T Engineering can further enhance its reputation and reach, build stronger connections with Hong Kong, deliver meaningful programs and stay connected with its global network of alumni.